The modern combine harvester, or simply combine, is a versatile machine designed to efficiently harvest a variety of grain crops. The name derives from its combining three separate harvesting operations— reaping, threshing, and winnowing—into a single process. Among the crops harvested with a combine are wheat, oats, rye, barley, corn ( maize), sorghum, soybeans, flax ( linseed), sunflowers and canola. The separated straw, left lying on the field, comprises the stems and any remaining leaves of the crop with limited nutrients left in it: the straw is then either chopped, spread on the field and ploughed back in or baled for bedding and limited-feed for livestock. Combines, some of them quite large, were drawn by mule or horse teams and used a bullwheel to provide power. Later, steam power was used, and George Stockton Berry integrated the combine with a steam engine using straw to heat the boiler. At the turn of the twentieth century, horse drawn combines were starting to be used on the American plains and Idaho (often pulled by teams of twenty or more horses). In 1911, the Holt Manufacturing Company of California produced a self-propelled harvester. In Australia in 1923, the patented Sunshine Auto Header was one of the first center-feeding self-propelled harvesters. In 1923 in Kansas, the Baldwin brothers and their Gleaner Manufacturing Company patented a self-propelled harvester that included several other modern improvements in grain handling. Both the Gleaner and the Sunshine used Fordson engines; early Gleaners used the entire Fordson chassis and driveline as a platform. 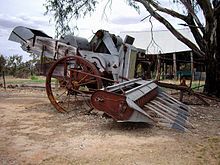 In 1929, Alfredo Rotania of Argentina patented a self-propelled harvester. International Harvester started making horse-pulled combines in 1915. At the time, horse powered binders and stand alone threshing machines were more common. In the 1920s, Case Corporation and John Deere made combines and these were starting to be tractor pulled with a second engine aboard the combine to power its workings. The world economic collapse in the 1930s stopped farm equipment purchases, and for this reason, people largely retained the older method of harvesting. A few farms did invest and used Caterpillar tractors to move the outfits. In the U.S., Allis-Chalmers, Massey-Harris, International Harvester, Gleaner Manufacturing Company, John Deere, and Minneapolis Moline are past or present major combine producers. In 1937, the Australian-born Thomas Carroll, working for Massey-Harris in Canada, perfected a self-propelled model and in 1940, a lighter-weight model began to be marketed widely by the company. Lyle Yost invented an auger that would lift grain out of a combine in 1947, making unloading grain much easier. 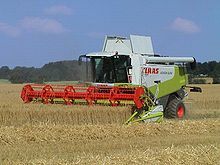 In 1952 Claeys launched the first self-propelled combine harvester in Europe;  in 1953, the European manufacturer Claas developed a self-propelled combine harvester named ' Hercules', it could harvest up to 5 tons of wheat a day. This newer kind of combine is still in use and is powered by diesel or gasoline engines. Until the self-cleaning rotary screen was invented in the mid-1960s combine engines suffered from overheating as the chaff spewed out when harvesting small grains would clog radiators, blocking the airflow needed for cooling. The first leveling technology was developed by Holt Co., a California firm, in 1891. Modern leveling came into being with the invention and patent of a level sensitive mercury switch system invented by Raymond Alvah Hanson in 1946. Raymond's son, Raymond, Jr., produced leveling systems exclusively for John Deere combines until 1995 as R. A. Hanson Company, Inc. In 1995, his son, Richard, purchased the company from his father and renamed it RAHCO International, Inc. In March 2011, the company was renamed Hanson Worldwide, LLC. Production continues to this day. For some time, combine harvesters used the conventional design, which used a rotating cylinder at the front-end which knocked the seeds out of the heads, and then used the rest of the machine to separate the straw from the chaff, and the chaff from the grain. The TR70 from Sperry-New Holland was brought out in 1975 as the first rotary combine. Other manufacturers soon followed, International Harvester with their ' Axial Flow' in 1977 and Gleaner with their N6 in 1979.